And more yet from Lei Day in Hilo, 1928. The lei that took first prize and made with great skill by Mrs. Lulu Kawelu—that truly beautiful lei was made from the flowers called “Ka ui o Olaa”¹ [Olaa Beauty], and it was made in 4 hours and a half by Mrs. Kawelu. ¹This plant is also known as “Nani o Olaa”. 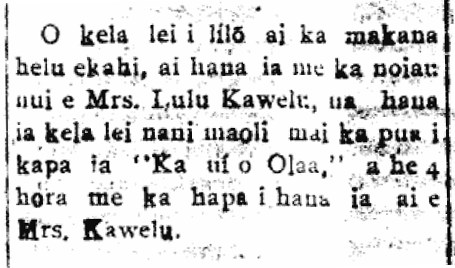 Ka Hoku o Hawaii, Buke XXI, Helu 48, Aoao 2. Mei 8, 1928.